A 26-year-old man died in hospital after being attacked in Colindale, north-west London, while a woman in her 30s died at the scene of a stabbing in Brixton, south London. A woman, 34, was arrested on suspicion of murder at the scene of the Colindale attack. Police said the victim and suspect were known to one another. A crime scene is in place and inquiries continue. 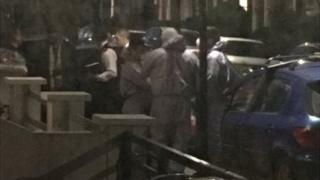 In the separate attack on Alexandra Palace Way, Haringey, a 19-year-old man was arrested near to the scene on suspicion of affray. He was taken into custody at a north London police station. In another attack today, a youth believed to be about 17 was taken to hospital after reports of a stabbing in Head Street, Limehouse, east London at about 15:15 BST. Police have cordoned off the area as enquiries continue. No arrests have been made and the victim remains in hospital for treatment.